It measures 88×48 meters and stands on a podium 13 meters above the surrounding terrain and 7 meters above the courtyard. It is reached by a monumental stairway. One of the most amazing engineering achievements is the Podium which was built with some of the largest stone blocks ever hewn. On the west side of the podium is the “Trilithon”, a celebrated group of three enormous stones weighing over 900 tons each. 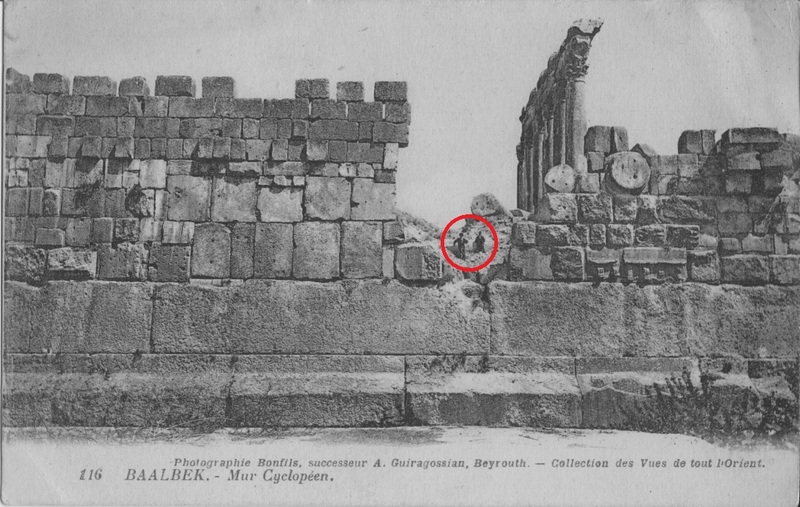 Some archaeologists might well wish that Baalbek had been buried forever. For it is here that we find the largest dressed stone block in the world – the infamous Stone of the South, lying in its quarry just a ten minute walk away from the temple acropolis. This huge stone weighs approximately 1,200 tons. 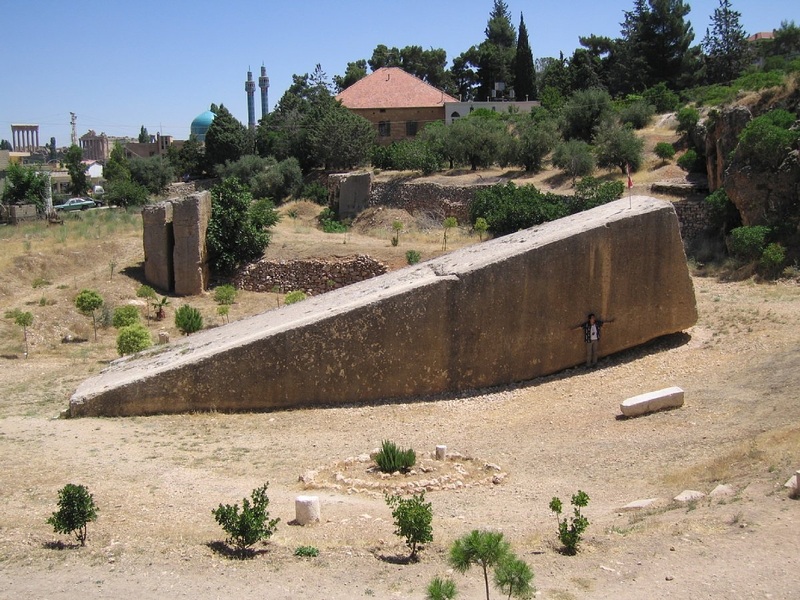 The large stone at Baalbek, known as the “Stone of the pregnant woman”. Archaeologists have now found an even bigger stone block at the site. This monster, which dates back to 27 B.C. is 64 feet long and 19.6 feet wide. Though it is still mostly buried, researchers estimate that it is 18 feet high and weighs somewhere around 1,650 tons, thus making it the biggest stone block from antiquity, reports the Archaeology News Network. 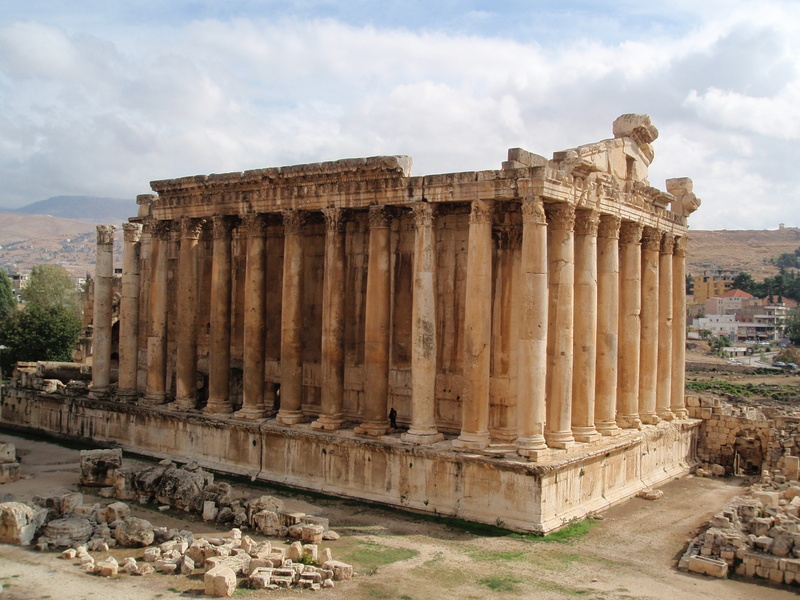 German archaeologists uncovered it in the quarry at Baalbek in what is now Lebanon. It is next to a fully exposed stone block of similar, but smaller, dimensions, known as Hajjar-al-Hibla, or Stone of the Pregnant Woman. 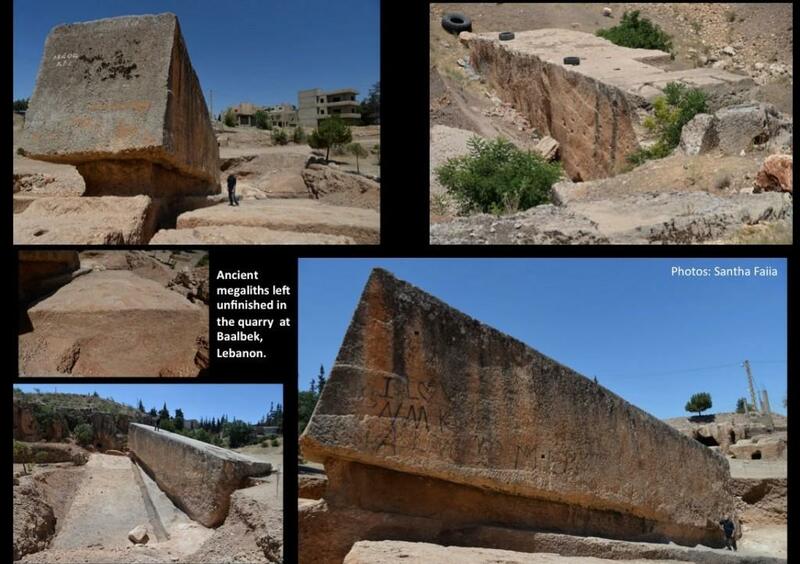 German archaeologists working at the Baalbek site in Lebanon have uncovered the largest known ancient block. Its weight is estimated at a daunting 1,650 tons. This incredible stone is more than twice the size of any known obelisk ever raised. Quarrymen apparently abandoned the obelisk when natural fractures appeared in its sides. However, the stone, still attached to bedrock, gives important clues to how the ancients quarried granite. Much of the red granite used for ancient temples and colossi came from quarries in the Aswan area (500 miles south of Cairo). 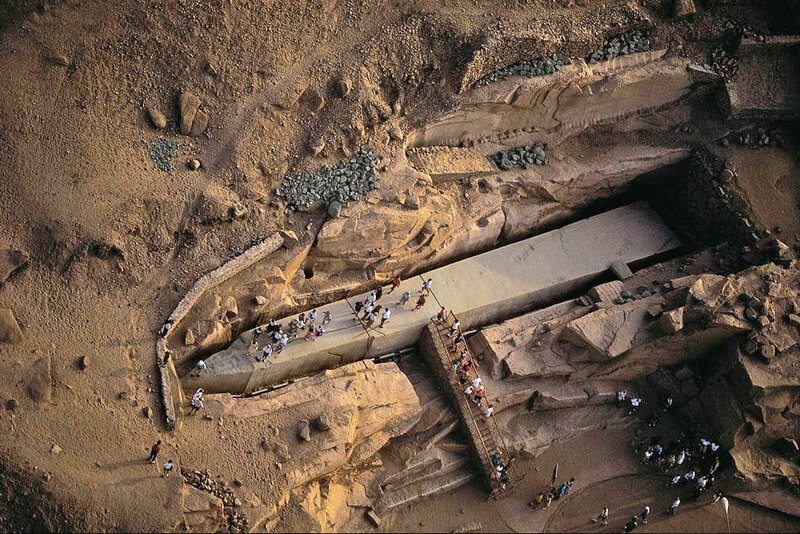 The largest known Egyptian Obelisk is known as “The Unfinished Obelisk”. This is one of the largest stones ever quarried and certainly on-par with the unfinished stone at Baalbek, Lebanon. It measures 120-feet (42 meters) and would have weight over 1,168 tons when complete. This Obelisk would have been taller than any ever raised. 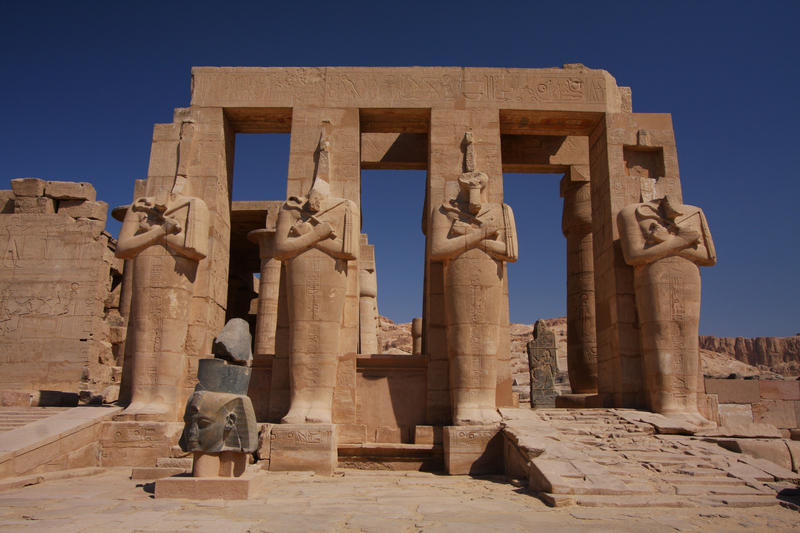 The Ramesseum is the memorial temple of Pharaoh Ramesses II. Originally called the House of millions of years of Usermaatra-setepenra that unites with Thebes-the-city in the domain of Amon. Ramsseum Temple, West Bank of Luxor, Egypt. In front of the ruins is the base of the colossus of Ramesses. 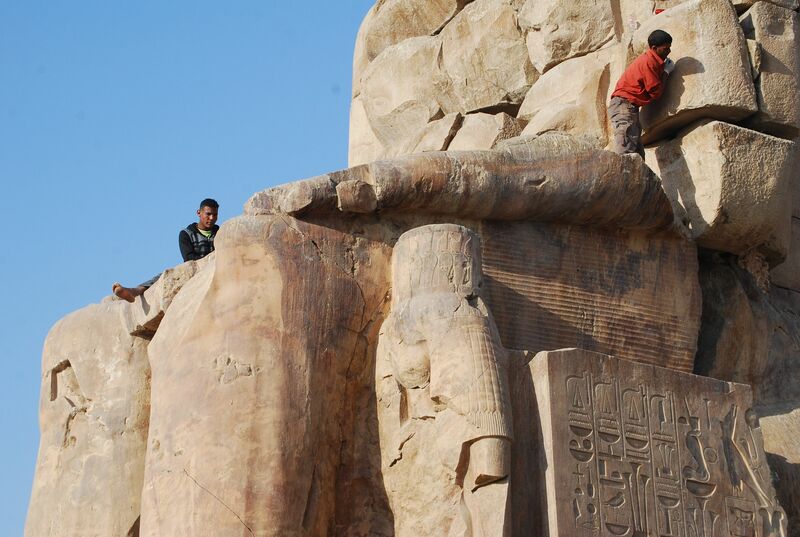 On the granite colossus’s shoulder is an inscription describing Ramesses as the “Sun of Princes”. The statue fell into the Second Court and the head and torso remain there. The other broken pieces are in museums all over the world. 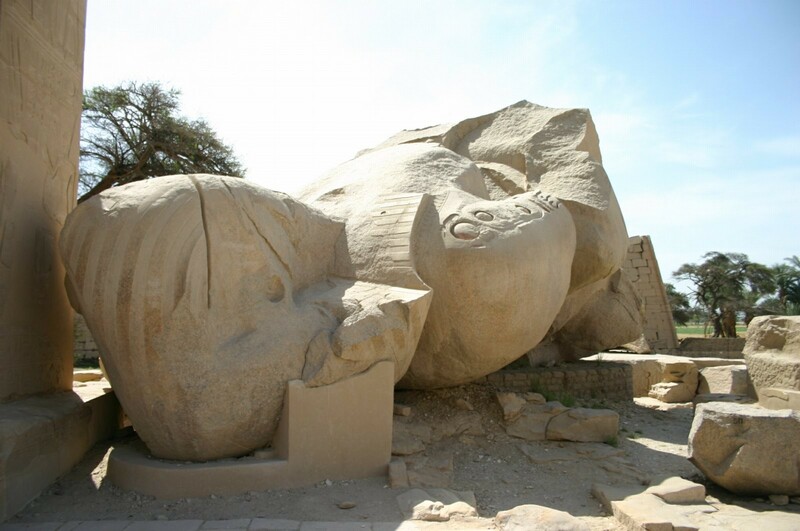 Only fragments of the base and torso remain of the colossal statue of the enthroned Ramesses, (19 meters high and weighing around 1000 tons). The stone for the statue was transported 170 miles over land from Aswan to Thebes. This would have once been the largest statue (except statues carved in situ) in the world. These two giants were built from a single piece of stone each. They are orientated towards the sunrise at winter solstice. 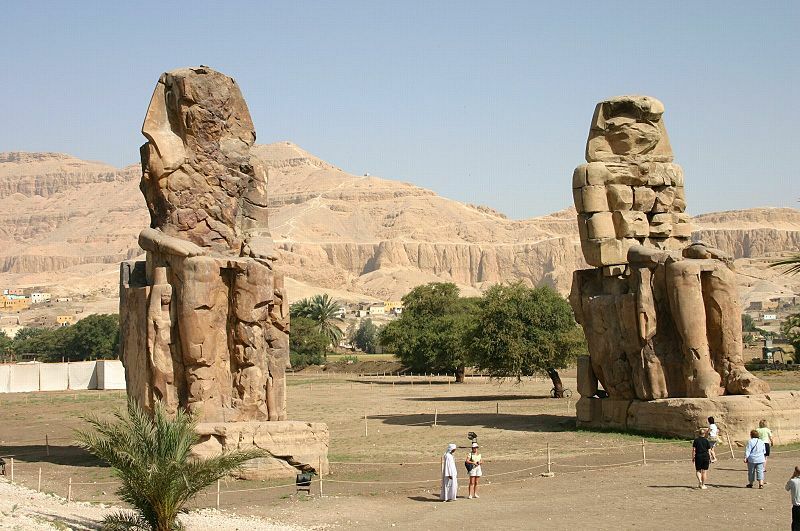 The Colossi of Memnon are 65-feet high and are carved from quartzite. They are wearing the “Nemes” head-dress and originally had “crowns”. The weight of each statue is estimated at 800 tons. The Colossi of Memnon, Egypt. The statues are made from blocks of quartzite sandstone which was stone quarried at “el-Gabal el Ahmar” (near modern day Cairo) and transported 420 miles over land without using the Nile to Thebes. The mortuary temple, built for the eighteenth-dynasty king “Amenhotep III” (1390-1354 B.C. ), that once stood behind these two figures was completely stripped for its masonry. Amenhotep III’s reign was one of the most prosperous and his mortuary temple covered 350,000 square meters, the largest temple complex ever built in ancient Egypt. The two statues originally decorated the temple’s entrance gate and have been damaged by ancient tourists and the forces of nature, including an earthquake in 27 B.C. that shattered the eastern colossus, causing a bell-like sound to occur at the statue. Ant-size workers on the Colossus of Memnon in Luxor.